Walk down the aisles of your favorite kitchen or department store and you’re liable to find more kitchen gadgets that you can shake a stick at. Each one promises to be the device that will change your life, offering convenience and success in cooking. Unfortunately, most of them deliver disappointing results, taking up cabinet and drawer space that could be better used. There are, however, several gadgets I consider “must haves” in the kitchen. They really do make cooking easier. In other words, they actually work. A sharp box grater is going to get a lot of use. From grating blocks of cheese to shredding vegetables, a box grater is far easier to use than a flat one. Get one that is razor-sharp, solidly constructed, and has a comfortable handle. I will often use a box grater to grate carrots for salads, instead of the typical julienne cut. It’s faster and gives me more consistent results. Fishing pasta or vegetables out of boiling water with a spoon is tedious work. Only a colander will do the trick, easily. Make sure you buy a large one with small perforations. A wide base is a bonus. That way, it can sit in the sink without tipping over. Acting as a second cousin to the colander, a mesh strainer can help with all kinds of tasks. I have two of them, a large one for pressing cooked berries and other things through, to remove seeds or other unwanted bits when making sauces, and a smaller one for dusting powdered sugar over desserts. Make sure yours has a deep bowl and sturdy handle to avoid it bending and breaking over time. I also use my small strainer to strain the solid bits from bacon grease. I refrigerate the rendered bacon grease and use it from time to time as a flavorful fat for cooking other dishes. I have a love-hate relationship with garlic presses. Crushing and mincing garlic with a chef’s knife is simple enough, but the pieces are rarely uniform and it can be hard on the hands. The way you handle garlic changes it’s flavor in dishes and a garlic press will give you a fuller, more evenly distributed, and less acrid, flavor. They can be difficult to clean, though. Get a sturdy one with a bowl large enough to handle two cloves at once. Make sure it has a simple to use cleaning attachment, as well. I love these so much, I have three of them. You want a wide, fairly firm blade to make mixing and folding easy, but flexible enough to get into tight spaces when scraping a jar. I’m constantly amazed how many people don’t use these to scrape out the last bit of peanut butter, mayonnaise, jam, and other bits in condiment jars. Just because the butter knife isn’t working so well doesn’t mean there’s not enough peanut butter to make a sandwich or two left in the jar. More and more I’m using the temperature of foods to determine whether they are done cooking or not, instead of just a timer. Under-cooking chicken, or overcooking it and drying it out, has become a thing of the past since I started using a thermometer. They’ll essential for good candy making. I like quick acting digital thermometers with thin probes, large displays, and wide temperature ranges. Unfortunately, the really good ones are also expensive. Don’t be shy about spending money on one of these, though. As always, buy the best one you can afford. Almost every application where a knife isn’t always easy to use is made easy with a good pair of kitchen sheers. Cutting and trimming chickens, pie dough, and parchment paper is much easier, let alone cutting open frozen food bags or snipping twine from roasts. Make sure yours are sharp with comfortable, slip-resistant handles. Being able to take them apart for complete and easy cleaning is important. How else are you going to accurately measure ingredients? Getting the wrong amount of a given ingredient in a baking is fatal to the food. I prefer dry measuring cups with straight sides, flat bottoms, and tops that are level with the handle. That way I can accurately scrape off excess flour when baking breads. I have 1 cup, 1/2 cup, 1/3 cup, and 1/4 cup measures. Some brands even have 3/4 cup and 2/3 cup measures, as well. As for liquid measuring cups, I love my older model 2 cup glass Pyrex. Their new ones aren’t as nice and, frankly, are hard to read. 2 cup and 4 cup sizes, with good handles and a pour spout, are my favorite, although the ones that look like drinking cups are pretty good, too. For spoons, again I like bowls that are flush with the handles. Deep bowls make measuring liquids easier. Slim, oval-shaped bowl designs are easier to get into small-mouthed spice jars than circular designs. 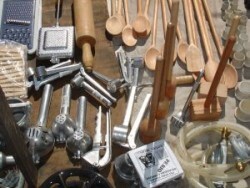 Next time, I’ll feature eight more kitchen tools and gadgets that really do work.